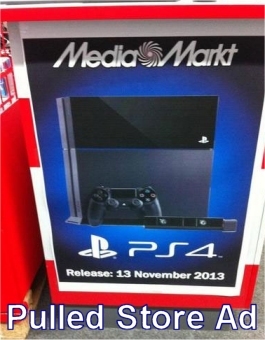 A photo has come to light taken at a large electronics retailer in Amsterdam named Media Markt which shows a PS4 release date of 13th November 2013. The ad has subsequently been taken down but there is no reason to believe that a respectable European retailer would make up such a poster as a publicity stunt. We can only assume that the date either came from Sony or somewhere else in the retailers supply chain. Sony have described the rumoured date as "speculative" which doesn't really confirm or deny it, however it would match previous releases over the years. The official line is still "holiday 2013" with no indication as to whether the launch will be simultaneous worldwide or separate dates for different territories. The console will cost £349 in the UK with stock shortages likely in the run up to the festive period.